Son Of Saul opens with people digging graves. What they’re doing is clear, but the image itself is not, and it isn’t until someone walks into the foreground of the shot that we can be certain that the blurriness of the background is intentional, as opposed to some problem with the projector. The someone is Saul (Géza Röhrig), a prisoner at Auschwitz in 1944, and for the 100 or so minutes that follow, he’ll mostly be filmed in extreme shallow focus, so that everything outside his personal radius fades into an indistinct fuzz. For certain, this is an act of mercy toward the audience, a way to muffle the horror: Were we allowed to see, to really see, all the atrocities happening, Son Of Saul might be unbearable. But the shooting strategy serves a psychological function, too. Saul, our tour guide through this nightmare, has learned to tune out. He operates on borrowed time, an empty shell in motion. Blurry is how he wants to see. Numb is how he wants to feel. That fugue state won’t last, however. Saul is a Sonderkommando, one of the favored Jewish prisoners put to work in the concentration camps, their labor buying them a few more precious weeks, days, or just hours. Early into the movie, as he’s performing the chillingly routine task of clearing bodies from the gas chamber, something happens that rips him out of his protective cocoon of detachment: He becomes convinced that a boy, barely a teenager, wheezing his last breathes after somehow surviving the gas, is his illegitimate son. Saul is helpless to save his life, of course, but maybe he can do something else for him; stricken with a sense of obligation, the man launches into a quest to secure the boy a proper Jewish burial—hardly an easy feat in a death camp. No film set over a single day at Auschwitz is going to be an easy sit, and there are moments here, like a mass midnight purging, that threaten an audience’s capacity to keep watching. But Son Of Saul, for all the enormity of its subject matter, is an oddly gripping experience—a vision of intense purpose found in what may be the final hours of a life. It’s also a pretty stunning formal accomplishment, especially coming from a first-time filmmaker. László Nemes, who directed and co-wrote, worked under Werckmeister Harmonies director Béla Tarr, from whom he seems to have learned a great deal about space and scale, though the Hungarian master never made a film with this much relentless forward momentum. Once introduced, Saul never stops moving, and Nemes follows him step by step, in tight Academy ratio close-up, as he works his way across what feels like every square inch of the camp, searching for a rabbi to perform the last rites. Son Of Saul conveys, with apt thoroughness, the bureaucratic order of Hitler’s final solution, the working parts—human and mechanical—that allowed for a place like Auschwitz to function. (It’s that infamous banality of evil, expressed in microcosm.) But the film also shows how some culture survived and developed even here, in the bunkers and behind the guards’ backs, where secret schemes and miniature conflicts play out and where information travels through whispers and in multiple languages. Son Of Saul is the rare Holocaust drama that finds actual drama, and not just despair, in the living hell of a concentration camp. It’s hinted early on that Saul may be wrong about the boy, that he may have invented the blood relation in his mind. Whether the child is his or not is irrelevant; the film is more interested in providing actual agency to a man stripped of everything, to giving him an honest-to-God choice. It’s all related to the moral dilemma of his moral mission: As it eventually becomes clear, Saul is part of something larger than himself, a resistance movement among the Sonderkommandos, who are plotting an escape. By choosing to privilege his newfound crusade over his role in the plan, is Saul choosing self-interest—some form of fulfillment before he dies—over the potential survival of the group? (“You failed the living for the dead,” someone eventually tells him.) If Son Of Saul, with its elaborate handheld following shots, sometimes resembles an especially ambitious and robust Dardenne imitation, it’s also the rare film that feels indebted not just to those sibling directors’ style but also to their profound ethical and spiritual inquiry. Plenty have found something uncomfortable, even obscene, in the way this remarkably assured debut lends one of the darkest chapters in history the tick-tock urgency of a thriller. This is not a new criticism of the genre: Films about the Holocaust endure because of a combination of the imperative to remember and a perverse fascination, so it’s natural that so many of them flirt with exploitation. 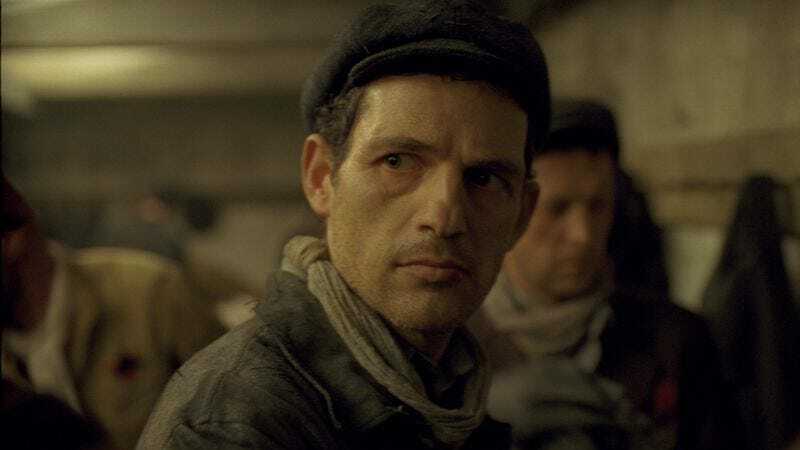 Son Of Saul avoids the sentimental catharsis of Schindler’s List, but there’s no denying that, by sending someone racing through the labyrinth of the Nazi death machine, Nemes has made some form of entertainment out of the unfathomable. But he’s also introduced a title character with actual flaws, not the martyr another filmmaker might stick into this premise, and he’s cast an actor—Röhrig, an unknown unlikely to stay that way for long—who resists bidding for the audience’s tears or reverence at every turn. 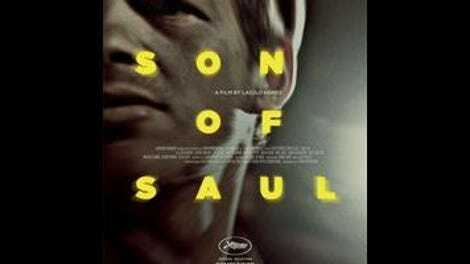 Son Of Saul sees humanity in effort, identity in action; it watches someone with nothing, a man reduced to a statistic, get a piece of himself back, mostly by finding some meaning in a place of meaningless evil. Even when the images themselves blur, the power of that scenario remains crystal clear.